Shelly Rae Clift had a really bad bike crash last July. She doesn’t even remember how it happened, only that she was riding to work on the Burke-Gilman Trail in Fremont. She was told later that she hit one of the metal posts that keeps cars from entering the trail. Despite the traumatic experience, Clift has been anxious to ride again. After months of recovery when she’s had seizures due to the brain injury, she got permission from her doctor to ride again three weeks ago. And she couldn’t look any happier as it was time for her to keep riding to work, first to downtown, then to Issaquah by bus. Read Clift’s own account about her bike crash on her blog, here and here. 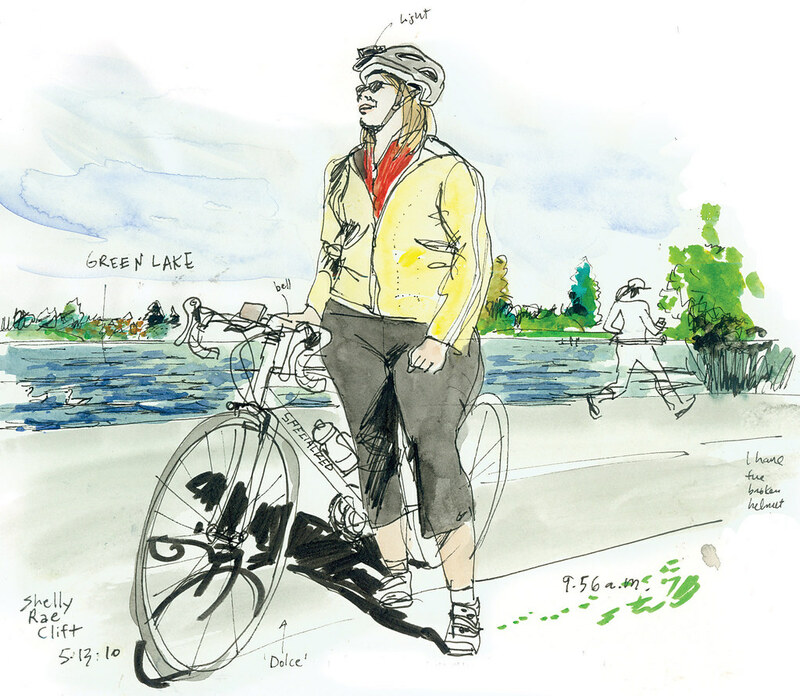 Next week I’ll share a sketch of another bike commuter, Glenn Hinrichsen, who commutes 32 miles three days a week. Hinrichsen had a stent put in his heart seven years ago.